Employers are responsible for fire safety in the workplace, which includes carrying out and regularly reviewing a fire risk assessment, informing staff of risks, putting in place and maintaining fire safety measures, planning for an emergency and staff training. Most fires can be prevented by adopting the right behaviours and procedures. Speak to our team to find out about the fire services that we offer across the Frome, Shepton Mallet area. Our Fire Experts: With many years' experience our fire and security team offer high quality fire systems and can provide their expert opinions and advice to help ensure your property is safe. Fire safety & procedures should not be taken lightly, we aim to provide services to help you protect from the risks of fire. As a good employer you’ll want to follow fire regulations, because ensuring the safety of people and protecting your assets is important to you. If you don’t follow these legal requirements, you could receive a fine or even a custodial sentence. Minor penalties can be up to £5,000 and major penalties can have unlimited fines and up to two years in prison. Failure to follow these regulations will mean that your property is not covered by insurance. All employers are required to carry out a fire risk assessment and based on their findings, put the necessary protective safety measures in place. This means having safety measures and equipment in place including a fire alarm. All equipment also has to be regularly maintained and tested. Regulations also state that employers need to make special arrangements for people with mobility needs. For example if one of your staff members is a wheelchair user, ensure there are people to help him or her escape in the case of a fire. The fire safety in the workplace section of the gov.uk website has further information on fire safety and procedures in the workplace, including guides on risk assessments and the appointment of a professional risk assessor. 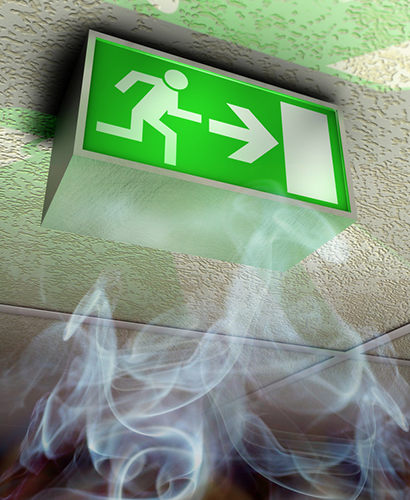 Specialist companies, such as BWS Security Systems, can help your business meet legal fire safety requirements and protect your staff, customers, and premises. Ensure you appoint an accredited supplier, which uses British Standard and certificated fire protection systems. For more information on BWS and its fire protection systems for Bath businesses and the surrounding areas please go to speak to a trained advisor on 01225 800 602.